Captain Rex gets the what used to be referred to as the back country slam on the fly! Although FWC has changed the rules and the species (to get more species involved) some anglers still consider this an “off the record” accomplishment. 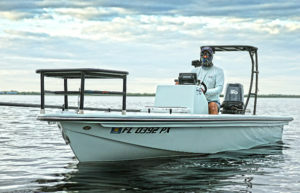 Captain Rex Lands the tarpon, snook, and redfish in the same area of Charlotte Harbor earning “the slam”. All while on board the Dragonfly Grand Slam 17 Skiff. Nice accomplishment. Enjoy the video.